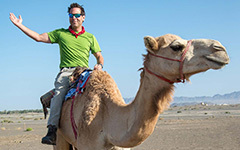 I’ve been in Oman for over ten days and seen plenty of deformed rocks—it is what I came for. What follows are a series of images illustrating deformed Omani rocks: there are folds, faults, fractures, and veins. This stuff is eye candy for a structural geologist. Big road cut near Nizwa, Oman exposed folded and tilted strata. This first photo is a stitched panorama using our GigaPan apparatus of a big road cut on the main highway between Muscat and Nizwa. 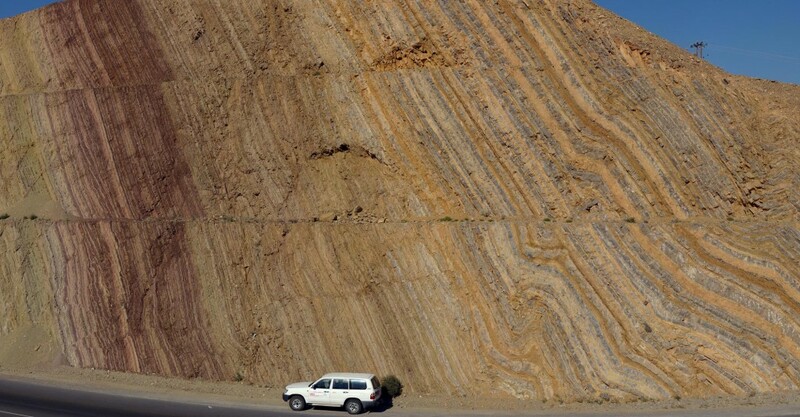 Notice the tilted and folded strata of the Hawasina sedimentary sequence and the lovely 4WD vehicle (unfortunately not our vehicle, we’re driving a saloon car). Here is a small outcrop of crumpled sedimentary layers near the village of Al-Taww. It is complex in detail. Tension gashes/veins cutting layered limestone and dolomite, Oman. Notice the scale bar in this photo, an Omani 50 baiza piece that is about the size of a U.S. quarter. The rock in this photo is interlayered limestone (gray) and dolomite (beige) and the original sedimentary layering is tilted (lower left to upper right). The distinct white structures are tension gashes/veins, fractures that opened and immediately filled with the mineral calcite (white). 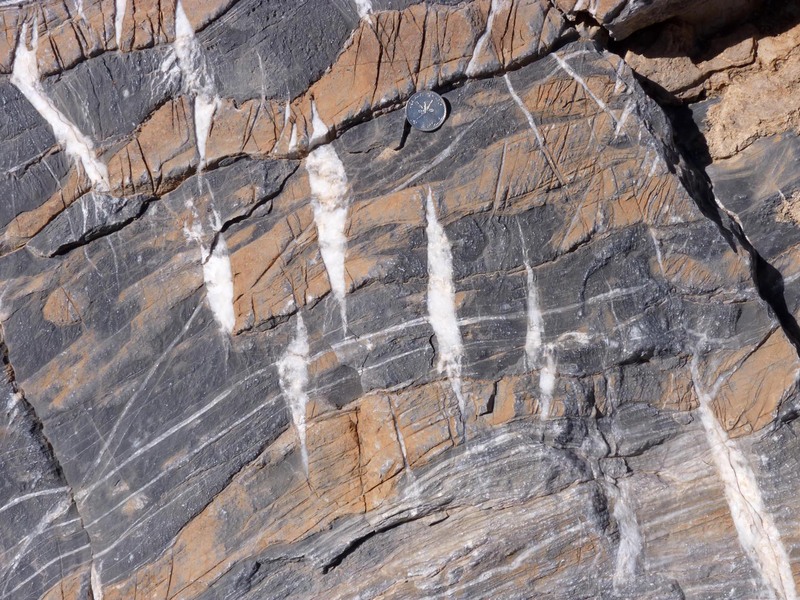 Just where did the calcite in the veins originate? Slickensides on serpentinite-coated fault, Oman ophiolite. 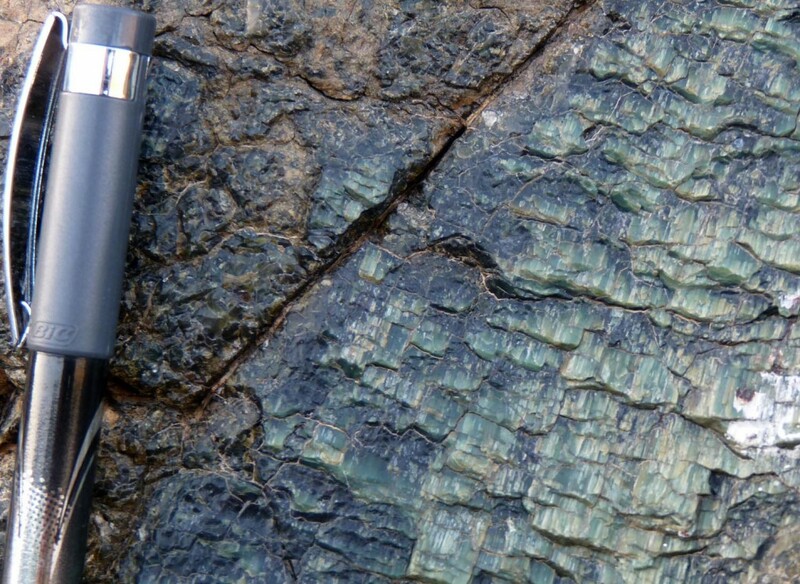 This image illustrates a close-up view of slickensides on a serpentinite-coated fault in the ophiolite sequence. The linear and stepped morphology of the slickensides are useful for determining the kinematics of faulting. A mountain-side of folded strata, Wadi Muaiydin, Oman. The last image is of a mountain-side north of the village of Birkat al Mouz along Wadi Muaiydin, exposing a dramatic fold sequence in Mesozoic limestones. Nice stuff! 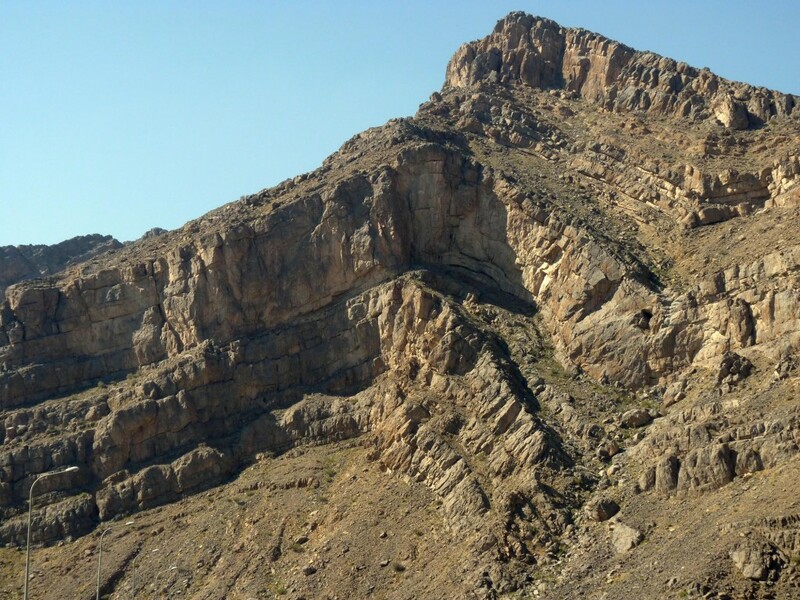 Why were these Omani rocks fodder for the tectonic cannon? When were these rocks crumpled, broken, and faulted?